Visitreno :: View topic - Happy Birthday to Me From Reno! Happy Birthday to Me From Reno! 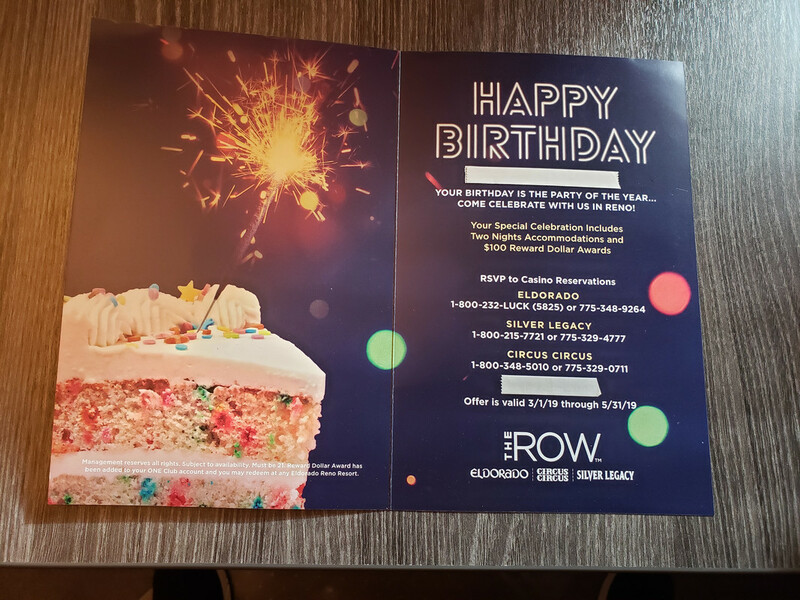 Posted: Feb Sat 23, 2019 10:06 am Post subject: Happy Birthday to Me From Reno! My birthday is in March and I recently got this card in the mail from my friends down at "The Row." I have received birthday cards/offers from Silver Legacy in years past but I think the most I have ever gotten was $20.00 reward dollars and that offer always expired by the end of March so I had to use it or lose it within my birthday month. Well, check this one out! Two comped nights and $100.00 reward dollars and it doesn't expire until May 31. Sweet! Guess I better get my next trip booked before the end of May. Thanks, Reno! Wow, I wish my birthday was earlier in the year! Sounds like I can refocus my play back at the ROW properties. Have fun. Wife and I will be driving down sometime this summer. Good birthday prize from the ROW. Happy birthday! Yes, I was surprised. And I received another shocker of an offer. I have been going to Reno for at least 25 years and have never received a complimentary cruise! I am stunned! I am a twice a year visitor tops (haven't been there since last October). I am so excited! Needless to say I have booked my airfare for that weekend. Then I can also still use my $100 birthday offer which expires May 31. Admittedly, when the 3 properties came under one ownership over 2 years ago and merged players clubs benefits I mistakenly assumed the benefits would subside. But I've been pleasantly surprised that I am still receiving very fair offers every month and now a cruise! I love cruising and have been on several cruises but never with Celebrity so I am looking forward to experiencing a new cruise line. I am only at the Silver card level (the second lowest card level) and will never come close to Gold so I certainly can't complain about the offers I am receiving. So yes, I would try to refocus your play at The Row and see what happens! Good luck! Look for a trip report from me at the end of May!